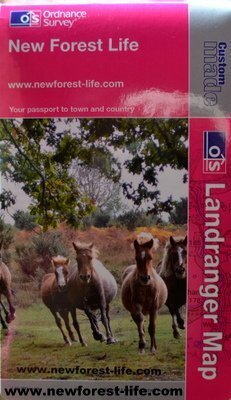 My New Forest National Park Life. Why Do I love living here? Let's find out what makes it so special? I'm Christina and I'm passionate about living in this beautiful place - did you guess? I'd like to share with you the joy and beauty of living in this lovely environment, as well as some of the sadder issues I encounter as part of life here. New Forest pony with distant views. I live inside a cattle grid (in a cottage not a cattle grid!). I'm a New Forest Commoner which means my animal(s) roam outside my gate. The animals you see aren't "wild" but are all owned by Commoners like me. We love and respect our animals and an awful lot of hard work, care and attention goes into keeping each and every one of them safe. Safety is an ongoing issue whether it's road accidents, feeding them by the roadside or other dangers. What do you do if you hit an animal? The latest report shows just how many of our animals are killed or injured on the roads each year. Happy Easter from the New Forest - but a word of warning. The police recently warned me how car park thieves work - I never, ever leave anything in my car and always take my bag (if I have one) and valuables with me. Apparently you may be being watched and the thieves are looking to see you either store your valuables (perhaps hidden under a seat? - it doesn't work!) or put them in your boot. They are then ready to break into your car once you've left it. I always have my valuables stashed in my pockets but that again can make them think I've stored a bag somewhere in the car - it's hard to win isn't it? Please take care - don't leave anything you would hate to lose in your car and watch out for people in cars or walking dogs near you as you leave the car. How sad that I need to post this warning? Total number of Commoner's animals killed and injured in 2018 was 89 compared with 78 in 2017. This information was taken from the Facebook page of the New Forest Roads Campaign which is a very valuable and very up to date source of animal accident information - please follow and support. Very depressing figures I think you'll agree? It often feels like a huge uphill struggle - but it is worth it! All my latest news is updated on my Blog. You can use the Custom Search boxes to also find pages even if you only remember what you read by one keyword. 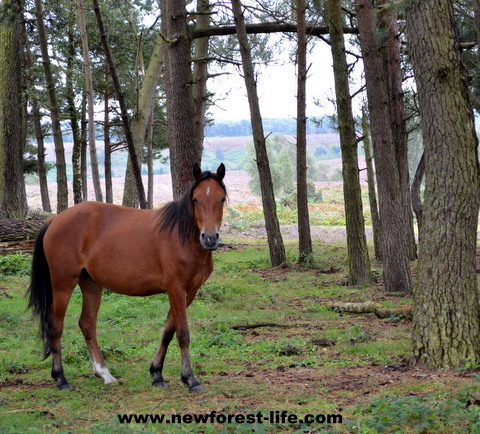 Please enjoy my New Forest life photos (all copywritten) and recommendations with me, ready for your visit. 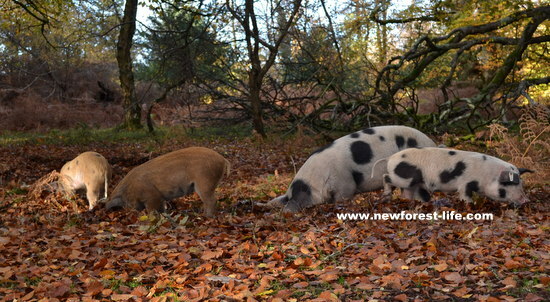 I get many questions about the New Forest pigs Last year I saw a lovely little gang of 12! with their mum. I had to wrestle a plastic bag off one piglet so please always take your litter home - it could save an animals life! 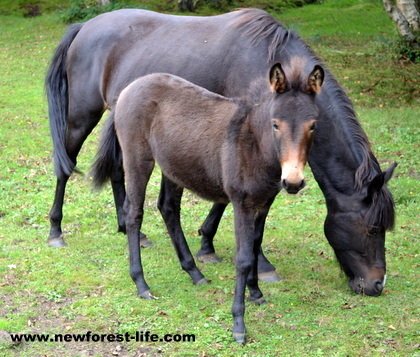 New Forest foal and mum. Please do not stop by the road if you see one! it encourages them towards danger. Please.........Slow down on our roads and add an extra 3 minutes to your journey. Please don't feed them by the roadside - it is where most of them get killed if motorists have encouraged them with titbits! Please don't feed them at all - they always get enough food and can die a painful death from a "treat!" You may be thinking that there's a lot of whinging/rules here but believe me as Commoners we see potential dangers to our animals on a daily basis. Would you like a monthly Newsletter email from me? It will mainly cover the problems we have on our New Forest roads and other welfare issues for our commoning animals. However, any tales or issues I think you'd enjoy will also be included. Urgent Road Safety Information for Visitors and More Importantly Locals! Please watch this video. It explains just how carefully you need to drive on our New Forest roads and that the animals who roam freely have right of way - perhaps something you weren't aware of? If you hit an animal and injure or kill it you must report it - ring 101. The police will contact the Agister for that area. The animal may run off after being hit - still report it as it may end up lying injured not far away and may die in agony. The Agister will search the area and try to find the injured animal so the owner can be contacted and a decision made on what the kindest outcome for the animal will be. 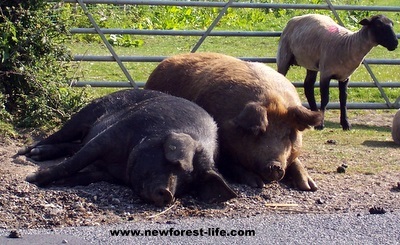 New Forest National Park pigs doing what pigs do best - relaxing in the sun! And a sheep -ish friend too! I've just put up new info about the Lepto inoculation you should be giving your dog if you live or visit the New Forest. Lots for you to read and then make your own decision on. There's a new dog health scare this time involving a parasite from Europe which has been found in ticks in Essex. You've probably seen it in the media. Find out what I'm doing for my dog. Alabama Rot or CRGV seems to be raising it's head again. I've been getting lots of inquiries on the New Forest dog death illness and Alabama Rot. I've added updated info so please check it out. You may see this referred to as Cutaneous and Renal Glomerular Vasculopathy (CRGV) rather than Alabama Rot. They seem to be the same thing though. There's previous info which may help you too Dog death illness update. Dog friendly pubs now has its own page as well as dog friendly hotels and tips too. We do mud, hair and dribble here so you'll get a welcome at my recommended places! Watch out for adders - they love sunbathing in the heathland and may strike out at your dog. There are many All Access paths, suitable for the disabled visitor, right in the heart of this stunning National Park. I can help you find out where to stay too. At some you may be able to bring your dog. My walks and cycling pages have handy maps and routes for you to discover. The Animals - are my passion in case you haven't guessed? Since I saw my New Forest pony born I've become even more passionate about the safety, welfare and protection of all our Commoners' animals. No animal you see is wild - they're all owned by a Commoner - that's why I want to share this way of life with you. The pigs and piglets are hilarious during Pannage. This year they will be out from 10 September through to October and November (the actual date changes every year) depending when green acorns fall. Sadly, we no longer have our lovely pig and piglets outside our cottage but you should look out for them all over the forest in the autumn. 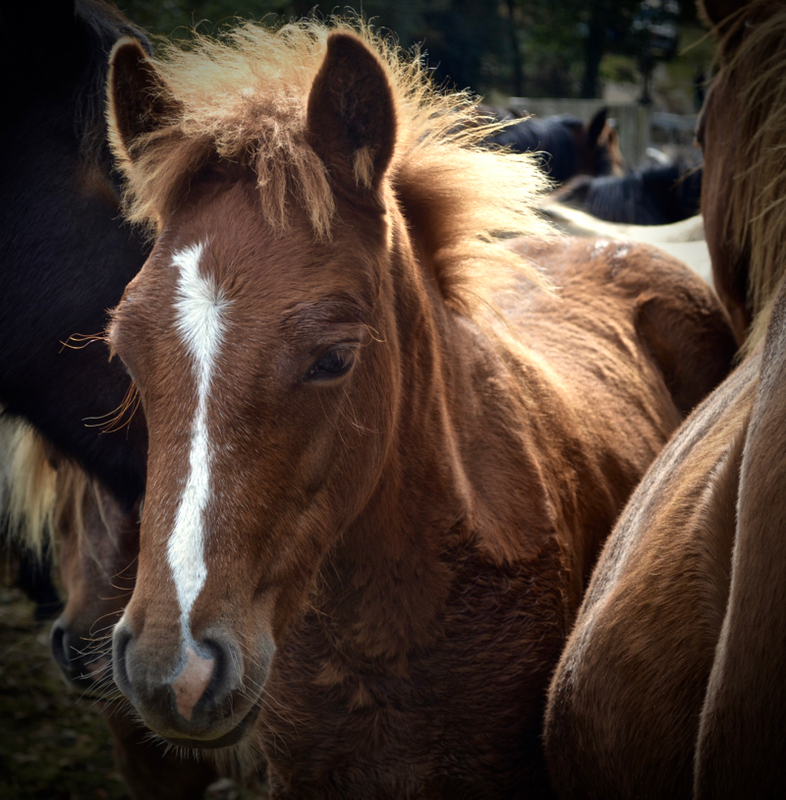 Enjoy my photos of some of the foals and all the ponies I see each day. Where can you find deer? Meet a donkey and her foal. 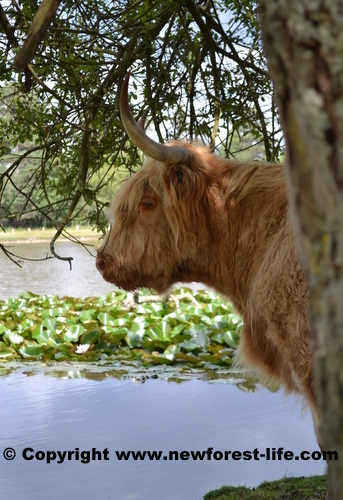 You'll be amazed at some of the cows you may see too. My animal road deaths and accidents page gives you some helpful safety tips. My Lost, Stolen, Found info has often helped people reconnect with their pets and animals. 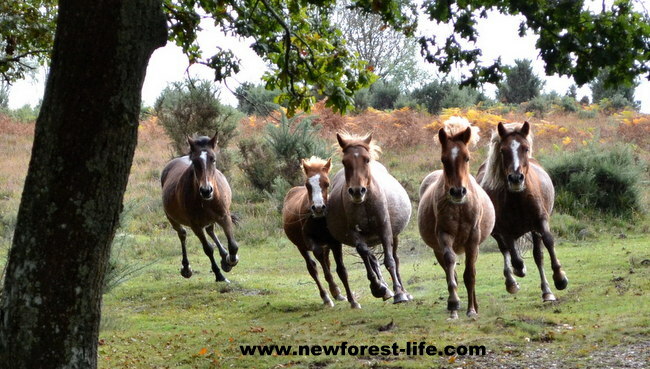 New Forest National Park ponies on The Drift - always take care. 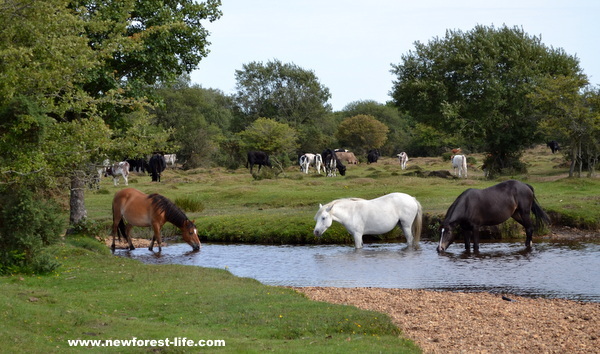 New Forest ponies on the annual round up - the Drift. Only active Commoners are allowed to attend the Drift, not the general public. 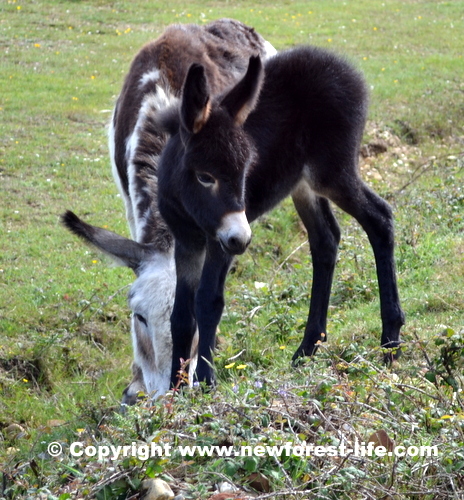 New Forest donkey foal - fluffy and very beautiful! I've got some nice Tea Rooms to recommend. Feeling hungry? Discover Farmers Markets I can recommend. Recently, I went to a fantastic Food Market with the finest, freshest produce. What's your favourite food? Now you can tell us! Are you thinking of a New Forest wedding? My Wedding Tips should help you plan yours. Are you looking for romantic lodges? I've visited these myself. Tip! (Please check the lodge is actually within the forest boundary? Some are advertised but are not within the forest at all). Or perhaps a unique B&B? : Or lovely forest or seaside Cottage? New Forest Safari tents are back! My camping info keeps you much closer to nature Tip!Keep your food locked away from the animals. New Forest getting about and having fun! It's fishing season (Hatchett Pond will reopen on June 16th 2018). I've just found a good place to day fish at Burley and also where you can try Fly Fishing too. So, get your bait (I'll tell you where) and hook up but please watch the animals' safety too. Are you a keen walker? We are. It's all on my walks and trails suggestions. Find out where you can have some stunning National Trust walks too. Cycling here is fantastic fun. There are over 100 miles of off road lanes and tracks. Explore my Four recommended cycling routes. We're always discovering and trying out new ones. Read my latest horse riding recommendation. If you're a horse rider I've discovered a fantastic safety app to help find you and your horse if you get into trouble. Now is a good time to visit our fairies at Furzey Gardens - you can even leave your own fairy message. I've recently visited the New Forest Wildlife Park. I saw beautiful animals in a wonderful woodland setting. I really can recommend a visit here. Exciting news if you're an Elvis fan. The last car he bought and drove the day before his death has come to the New Forest! My Beaulieu Review tells you all. Explore my Days Out tips with a Visit the coast at Lepe Country Park with wonderful views across the Solent, WW2 history and wildlife to explore and enjoy, for all the family! There is an amazing WW1 and WW2 history here - why not discover it with me. World War Two - evacuees, rations and lots more. You can ask a question or share a tale with us and even find out about a US airman awarded the U.S.A.A.F. Medal of Honor. Did we murder Royalty?... with an arrow? There are WW1 and WW2 Memorials for you to explore, so, find a memorial site to visit. It's a wonderful way to get close to the history of this beautiful National Park. Did Beaulieu have WW2 spies or secret agents? Prepare to be amazed! Why not discover my memorial day facts. It's all here for me to share with you. Visit New Forest Family Tree Forum and post your questions to find out more of your family history during WW1 and WW2. 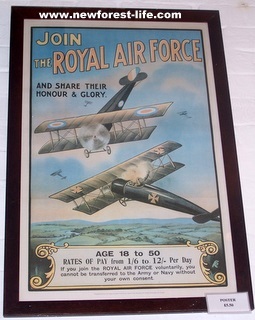 Were your relatives stationed here during WW1 and WW2? My Family Tree Building Tips suggests ways to find out about your past. We have discovered in our family tree searches that we don't come from royal blood! Get to know this beautiful National Park - as I know it, through my pictures. You can share your experiences on any page where you see * or Contact Me and ask a question. 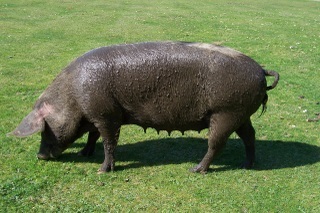 Our local Miss Pig after a cooling mud bath - she actually attended the local school fete on this day - without an invite! "Remember that animals have the priority on the roads within the New Forest boundaries. Please drive to the road conditions, be mindful that animals can be concealed within hedges, behind trees etc and will walk out into the road without any notice despite your approach. Please keep your speed down and by doing so you will increase your chances of being able to avoid collisions". For more advice please read my Animal Accidents info. 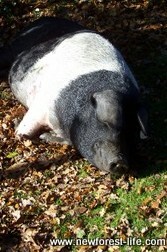 New Forest pig relaxing in the sun and smiling? At the moment, to live here I need to work to support this lifestyle. When eventually silver surfer status takes me over I know I can work from home and earn money from my very own home business. It is and will be hard work but whether you are a mum who wants to work from home or a silver surfer looking for a great way to spend some retirement time - there is a light at the end of the tunnel! Now, you can learn how to Build Your Own Site. Why not put on the kettle and find out more? And at the moment there is a Special offer for you to try! Now you can opt to pay monthly throughout the year - 2018 may just be your year! 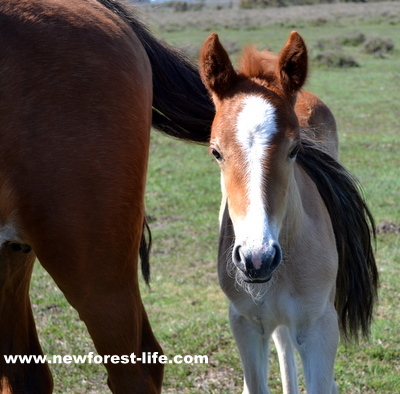 I hope you enjoy visiting New Forest Life and that you explore and enjoy this beautiful area with me. Finally, please do let me have feedback on how you feel about my New Forest Life website, and do tell me if there is anything you would like to see added to the site for your enjoyment. I hope you enjoy visiting the New Forest National Park with me, and that you take home many lovely memories too. Please Contact Me if you have any questions. Many Thanks. Check the latest weather for your visit. We do a weekly local update. Find out where to go to discover pigs like these. I can tell you the best place to see pigs and other animals. This was kindly given to me recently. It shows the National Park on 1:50 000 scale and is my own personal copy with my website on.